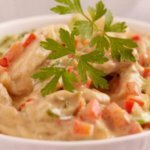 Chicken a la King is a creamy, comfort food style recipe which is nice for the whole family to enjoy. This easy chicken recipe includes fresh vegetables, sour cream, eggs, sherry and chicken stock. It's good over rice or pasta, or even mashed potatoes. If you want to add more vegetables consider peas or green beans on the side, or even broccoli. 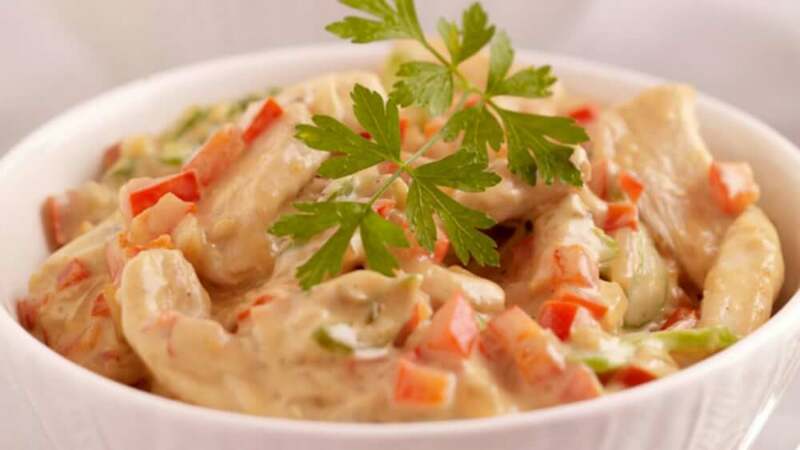 There are various stories as to the history of chicken a la King, although it's likely the original dish was invented by George Greenwald, the head chef at Brighton Beach Hotel in New York. He prepared it for his parents who owned the hotel in the early 1900s. The original dish didn't include the bell pepper but we added it for colour and extra flavour. For the chicken you can use pre-cooked supermarket chicken meat or leftover roast chicken. You can also just poach or steam some chicken before making this tasty, retro, chicken a la King recipe. 1. First melt the butter in a pan over a moderately high heat. 2. Now saute the mushrooms and pepper until tender, then add the flour and stock. 3. Keep stirring and cooking until thickened. 4. Stir in the chicken and heat it through. 5. Take the mixture off the heat. 6. Mix the egg yolks with the sour cream, red pepper, salt, pepper and sherry. 7. Add the egg yolk mixture to the chicken mixture and heat through well, stirring. 8. Serve hot with pasta or rice, and maybe peas or green beans.